Nothing really gets me as excited with nail polish as when I hear the words "New Collaboration Shades" from Picture Polish. Tonight I have the four latest ones and they are all such gorgeous beauties. 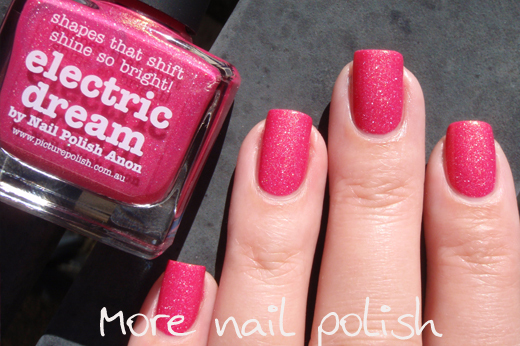 Electric Dream - by Nail Polish Anon. I'm not a huge pink polish wearer, but there is something about this pink polish that talks to me. I think it's it stunning gold shimmer that is suckering me in. This polish is actually a coral color because the gold shimmer mixed with the pink base lean it to the yellow side of pink. 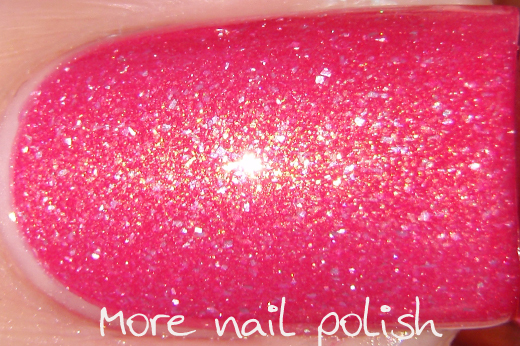 There is also a scattered silver holo flake that give this polish extra pow. Michaela's inspiration for this color was the soft corals she saw whilst snorkeling in Fiji. 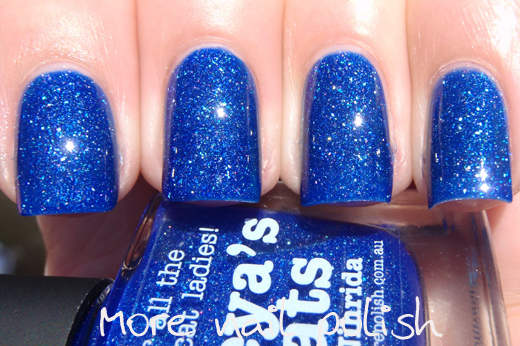 I've snorkeled in Fiji so I know what she is talking about, and this polish nailed it! 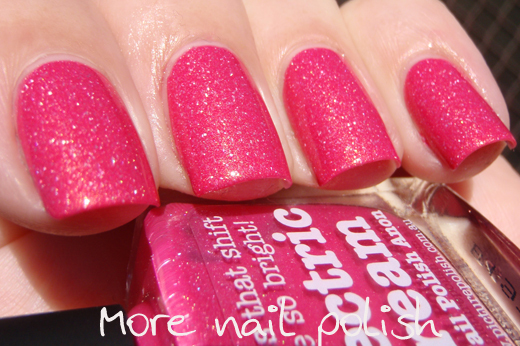 This is two coats of Electric Dream with Seche Vite top coat, photographed in the sun. Freya's Cats - by Nihrida. There is so much for me to love about this polish. First, it's created by Sasha, who writes one of the very first blogs I ever read. I even mentioned her in my first blog post ever more than three years ago. 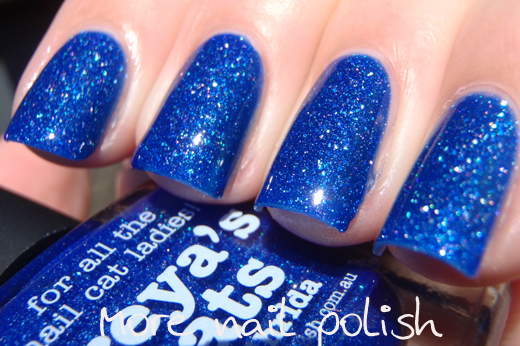 Second, this polish is for all the nail cat ladies. I know Nihrida is one, because I have read many a story about the kitties she has found and adopted during the years. I too am a nail cat lady, with five of them, all homeless babes that we took in. And finally, just look at this polish. 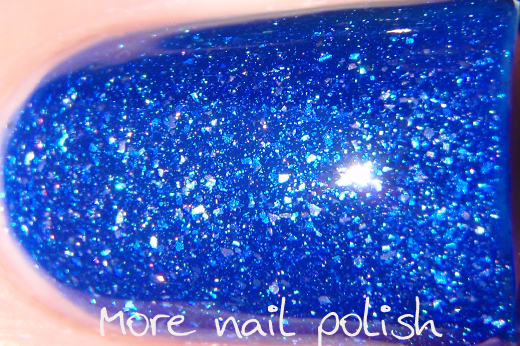 It's a stunning blue jelly full of the signature silver scattered holo flake that Picture Polish and Ozotic is renowned for. Beautiful. This is a lighter and brighter blue than Cosmos, but it is just as stunning. I chose to do three thin coats to get a nice depth of color, topped with Seche Vite. Photos taken in the full sun. 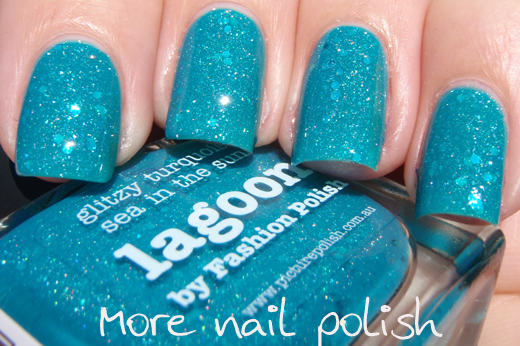 Lagoon - by Fashion Polish. 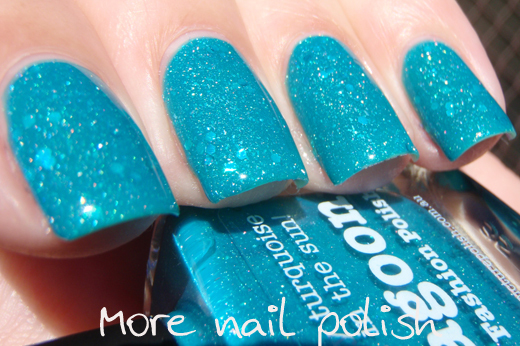 I doubt there would be any nail polish lover out there that doesn't already read Sam's blog Fashion Polish. Her swatch photos are some of the most perfect ones you'll ever come across and her blog is one that I never miss reading. Sam's creation is a turquoise jelly with the same scattered holo flecks, but it also has turquoise glitters that are an absolute perfect match in the jelly base. The glitters provide an extra bit of sparkle but they aren't overpowering on the nail. 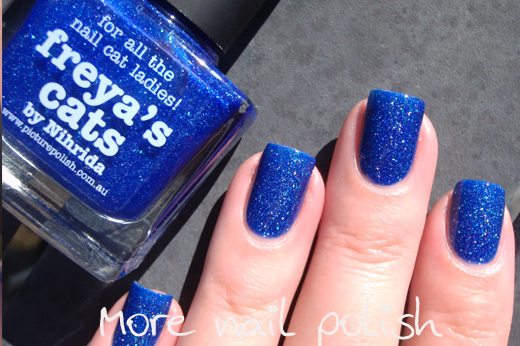 This is three thin coats, topped with Seche Vite, taken in the full sun. 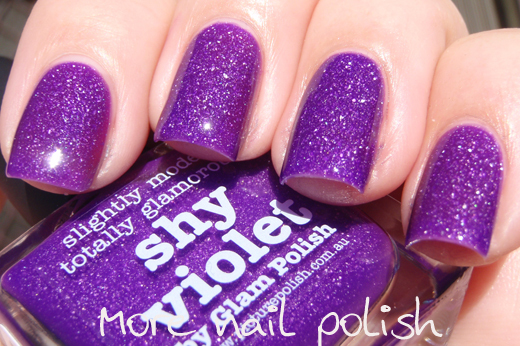 Shy Violet - by Glam Polish. 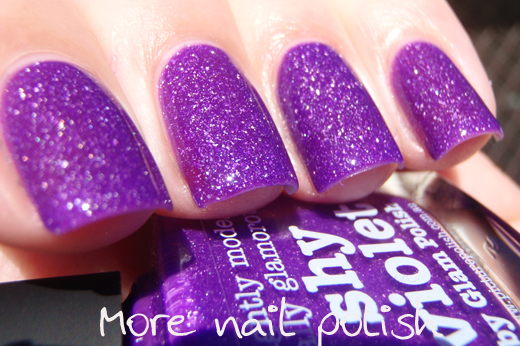 Shy Violet is a bright purple jelly polish with more of those signature holographic flakes. This one is a bit sheerer than the other polishes, so I did four thin coats. But the finished effect of those four coats has so much depth. This polish dries to a satin finish, which I'm sure is because of the neon pigment in this polish, but a thin coat of top coat makes it super shiny and doesn't dull those holo flecks. This is four coats with Seche Vite top coat, photographed in the sun. I also (finally) updated my Picture Polish Colour Guide to include a bunch of the collaboration shades that I didn't have in there yet. In the colour guide you can see side by side comparisons with Hope, Cosmos and Freya's Cats and Lagoon and Ocean. They are all totally different, and you need them all. I read your blog regularly and I have to say this: I love your blog! Your pics are gorgeous and you are such a positive person! Keep going! The Electric Dream is gorgeous! Thank you Sam - What a beautiful polish you created and I'll always be in awe of your work!! Gah I'm drooling over all of these! Oh. Oh my. Oh my goodness. This is a problem. 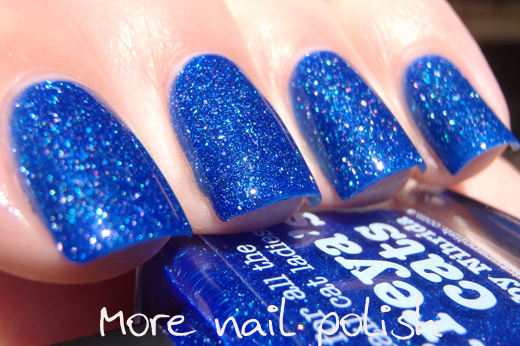 Thanks for adding 4 more polishes to my PP lemming list! 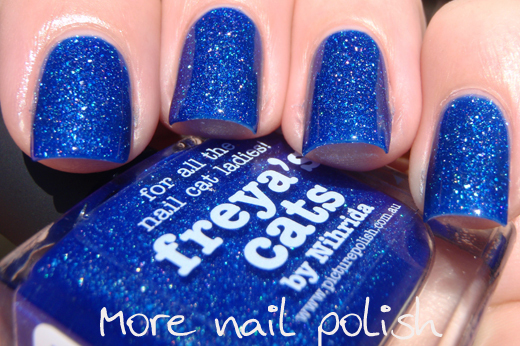 Freya's cats calls to me as I love blue polish almost as much as I love my fur babies. And Lagoon! The hexes look like bubbles in crystal lagoon water! Plus, I've convinced myself if I wear it my nails will look as good as Sam's do. A girl can dream,can't she?! These shades are all so stunning on you!